Thank you for patiently waiting to read Part IV of this exciting and important interview. In this installment, I asked Jobst to tell us more about his career path at Porsche and Avocet. The discussion then flows into his unique bicycling interests. Why does Jobst have only one bike? Why doesn't he believe in cycling races? What does he love best about Europe? You have lots of material to read below! 17. We discussed your engineering career in brief but a complaint was that I didn't burrow into specifics. Firstly, my readers and I are very interested in knowing how you landed a job at Porsche. Could you please elaborate on the nature of the work you had there? JB : Sure. I was stationed in Germany (Aschaffenburg) near Frankfurt in the US Army Corps of Engineers and wanted to buy a car because all I had was my bicycle as transportation. I found that I could buy a 356 Porsche at a reasonable price and did so. In that pursuit I reviewed the owner's manual and was told most of it came out of the factory shop manual, that I also examined. The translation from German to English was poor and in some places incorrect so I dropped in on the Porsche plant in Stuttgart-Zuffenhausen after I got out of the Army and was on my way south to visit my bicycling friends in Florence. I proposed to their personnel manager that I go to work there and with my knowledge of German and English along with my facility with automobile jargon in English, I could do the manual a service. I was hired to come to work in the fall and did a good job in translation, a version that was recognized as better than what they had. When that job was done, I asked to be transferred to engineering and was assigned to the chassis, brakes and steering division. When I got there, the project leader felt he had too many people and transferred me to Special Products (the racing department) that was just being started. As I started design work, more and more of the car was transferred to my drafting board and I did the layouts for the chassis, wheel suspension, brakes, steering and transmission. I got along fine in that team and stayed with it until the car won the Belgian GP and Mr. Porsche said it was too expensive. So when he had achieved what he wanted, that racing department was dissolved. I transferred back to the production car division and designed the steering and front suspension. 18. Looking back at Porsche now, what lessons did you learn? Would you drive a Porsche if you had the money to afford one? JB : From my work there, I discovered why one should not build rear engined cars, air cooled engines and torsion bar suspensions. That Porsche persisted in that design was unfortunate and you see they gave up on air cooling when it died everywhere else in the industry. I wrote for Wikipedia why we ever had air cooled engines in the first place but the Porsche faithful deleted most of that essay, as you can read at Wiki. The "Why" part of that thread is slightly what I wrote but has been diluted. 19. Interesting! So again, would you buy a Porsche or not? How about a Porsche instead of a bicycle? That's a trick question. JB : Today's Porsche is more a show piece with allusions to great handling and power, but it remains only a symbol with little practical value, much like a Corvette. These cars are mainly image with little real significance. Ever since returning the the US from Germany, I have driven one make of a station wagon or another. They have served me well and I have transported many bicycles to interesting ride locations. I don't think you can make a real parallel of driving a car and riding a bicycle. 20. Porsche was one of the many places you worked at. You also worked for Avocet. I understand you were a tire designer, is that correct? How did your hand play a role in better designs there? JB : When the Hoffacker brothers started Avocet, I came up with the name and the logo, which I had as my linoleum block Christmas card for 1973. I've carved a linoleum block for many years, something I learned from my father. The subjects are many - birds, machinery (RR locos), the Locher dual side engagement cog wheel and the Stelvio National Parks logo. I saw Avocet as a way of getting some bicycle features I couldn't get elsewhere. The Altimeter was an important one for me because it's logic has a good patent that is essential to accumulate climb, something others with altimeters cannot do correctly because they have no hysteresis that ignores small dips in roads or barometric fluctuations. I suspect most of them are not aware of these problems and never think of adopting that patented concept. It took me a while to explain it to Avocet engineers making the hardware and software. I also wanted slicks, recalling how well our Clement tubulars cornered on wet and dry without miniature car treads that do nothing. Avocet recognized the advantage and made the best slicks ever. To assure riders that one can corner on them, I had a picture taken with me cornering hard. They also had the lowest rolling resistance when they were built by IRC. IRC no longer makes bicycle tires. 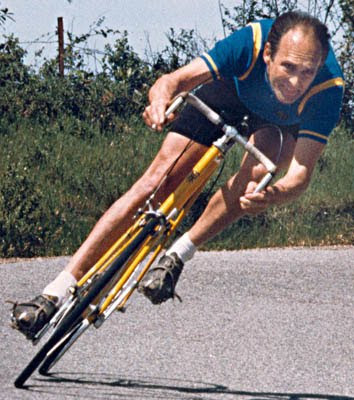 Photo showing Jobst Brandt testing a pair of Avocet tires. 21. Let's talk bicycles. You've often been photographed with a tall and yellow steel bike. Infact, I have not seen any other bikes associated with you. Would you tell us more about it? JB : When my Cinelli got old and developed cracks from riding Campagnolo Record hubs with a long overhung axle on the right end, my good friend and great riding companion Peter Johnson built me a new frame. Earlier, Tom Ritchey had built me a bicycle that I had wrecked by descending into a cross-drain on a forest descent, so Peter built the bicycle you see in photographs. It has an oversized downtube and is fillet brazed. It needs a paint job now that it is about 20 years old. The reason for yellow is that cracks can be seen better than on most other colors than white. I realized that getting rid of the crack generators was better than a good color. That's why I am riding Shimano 7-speed hubs that have no axle overhang as Campagnolo hubs. Peter also built me a new fork with a threadless steer tube for which Ritchey gave me the stem. 21. So you have no other bikes apart from the yellow one? JB : No. I never had more then one bicycle mainly because I maintain it and can ride only one. That's my main problem with the bicycle faithful. They collect these religious symbols and treat them as near human icons. 22. Typically, how much would you ride your bike in a year when you were young? JB : I have always ridden about 10,000 miles per year and probably still do, now that I am retired. That comes to about 200+ miles per week. After a recent car incident that caused a couple of broken ribs, followed by much rain (daily) I missed about four weeks of riding and am getting back in shape now. That isn't easy for an old man. 23. I'm sorry about the accident but for a person of your cycling calibre, you should be able to ease into cycling without problems. JB : I don't recall winters being so wet and cold but that slows me down these days. 24. As a well-respected engineer and cycling enthusiast, what do you think of UCI's decisions to ban certain bike designs? Do you think its healthy for the sport or are you one who supports tradition? JB : That is a mis-characterization of racing rules. The rules are there to attempt to make a "level playing field", not to prevent technical advances. The HPVA is there for innovative two wheel designs, most of which violate the concept of preventing mechanical advantage to win in competition rather than by athletic ability. As I mentioned, I was aware of that in my younger days when I was faster than all others on the road through ability rather than a special bicycle. I don't support tradition, in the sense of freezing technical advances to an older time. I think advancements can be made but not in "space age" technology for bicycles. 25. Do you believe that bicycle design has reached a state of saturation, if you will allow me to use that word? If not, where could some more genuine improvements be made according to you? JB : It is not bicycle (technical) but rather in styling design where the effort lies. Saturation only appears to those who don't understand what the problems are. Classically, the threadless steertube was a great leap forward and has not been accepted as such by most of the contributors to rec.bike.tech. There is where saturation lies. 26. Do you have time to follow cycling races and all the doping drama? Do you have any opinions on Lance Armstrong's uncertain comeback, or on the talented Alberto Contador? JB : I don't like professional sports and don't follow them, other than having seen the GdI or TdF on my bicycle trips in the Alps. That goes for team sports, skiing, and other "my aerobic abilities are greater than yours" type competition. No one benefits from that in contrast to demonstrations of skill as in music, painting, sculpture, and ballet. Art is full of pleasant venues. This other stuff is just a bunch of gladiators. Just look at the bodies of US football players. 27. Did you race back in the day? Were there any wins or accolades? JB : Only a couple of time trials. I decided that massed start races were full of hazards and some trickery. I only raced a couple of times before I decided to concentrate on touring. Dated photo showing Jobst standing proudly with his friend at the peak of the Penserjoch. This is a 1950 m foot climb near the Italian-Austrian border. 28. Touring is one what I wanted to concentrate this discussion on. Your Alpine tours are stuff of legend. I spend some time reading your colorful tour reports and loved the prose. It seems to me you have made an enjoyable annual tradition out of this. What got you interested in the Alps from a cycling standpoint? JB : My father was a tourist as I am and though he did his trips by car with the family, it was not planned with motel reservations but rather "eine fahrt ins Blaue" as it is called in German - "a trip into the wild blue yonder". When he took his appointment to Gen. Lucius Clay to go to Heidelberg, the US economic headquarters, he put us up in civilized central Switzerland and so doing took us on a car trips over the old and famous mountain passes. I recall these times as a high school youngster vividly as does my older brother. Of course I wanted to see those places again and doing so on a bicycle was a better experience. 29. If you don't mind, tell us about your favorite spots out there? JB : Pleasant hotels in villages or even solo in the mountains are common in Europe, something that makes it more pleasant. Also, these are family operations with no motel chain in the background. We have similar places in the Sierra and so we choose to stay there. 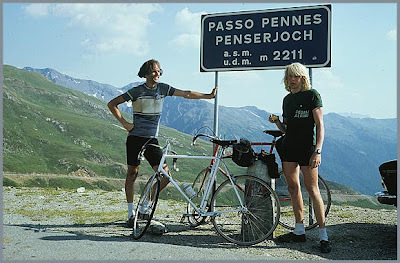 A photo from 2006 showing Jobst Brandt with his friend at the Iseran Pass in Savoie, France. 30. Have you openly supported bicycling advocacy? Also, what message do you have for those folks who desire to adopt bicycling as a mode of transport? JB : I think my advocacy should be evident from my ride reports. These reports are not filled with arduous hardships and suffering, but rather the beauty of the places and people I encounter. I think that is what life is about and many people have followed these trips. As I ride here and in the Alps, I am often greeted by name from people I don't know. I find personal notes taped to the poster of me at the cliff in the Refugio Bonetta. Don't cycle unless you are a good physical specimen, otherwise its a drag and no fun. Also, get off the million dollar non steel bicycle. "We pushed off into a cool sunrise, choosing the urban route through Celerina and St. Moritz (1837m) to get a closeup view of the ritzy hotels, so called after hotelier César Ritz (1850-1918) who invented the genre in Paris. Among other things, we passed the giant aerial tram, the Signalbahn, that connects downtown with ski and hiking area toward Piz Nair (3056m). Riding west along Lake Silvaplana, past Silvaplana (1815m), at the north ramp of the Julier Pass, the scene was right out of a tourist calendar. Farther on, we rode along the Silsersee, the source of the Inn River, to reach the one sided Maloja Pass (1815m). From here a curvy zigzag but brisk descent took us down the wall of the box canyon to the flat valley above Casaccia (1458m) and on down the valley toward the Italian border at Castasegna and finally Chiavenna (325m). We crossed the Mera River to ride along the west side of Lago di Como to appreciate the many unbelievably ornate villas with manicured gardens surrounded by stone walls, fences of fancy ironwork, and neatly trimmed hedges. Sail- and motorboats were sailing on the lake and once in a while a ferry/cruise boat plied its course between the major towns around the lake. Before I realized it, we had passed through Menaggio where I had planned to turn west to Lago di Lugano to view more villas, but we were doing all right here and continued to the outskirts of Como where we took secondary roads south of Varese to Borgomanero (538m). We found a wonderful hotel with a garden dining atrium at the end of a long cul-de-sac off the busy main street. We parked our bicycles in the garage and got cleaned up to appear for dinner in our travel finery to enjoy a delicious Italian dinner on this comfortably warm summer evening. During dinner, alpine swifts darted overhead, picking off insects while giving their characteristic modulated chirp as they worked until dusk. After that, bats took over the task. "